Looking to attend a free Warriors at Ease class? Check out some of these weekly classes, offered free of charge, by Warriors at Ease teachers across the U.S.! 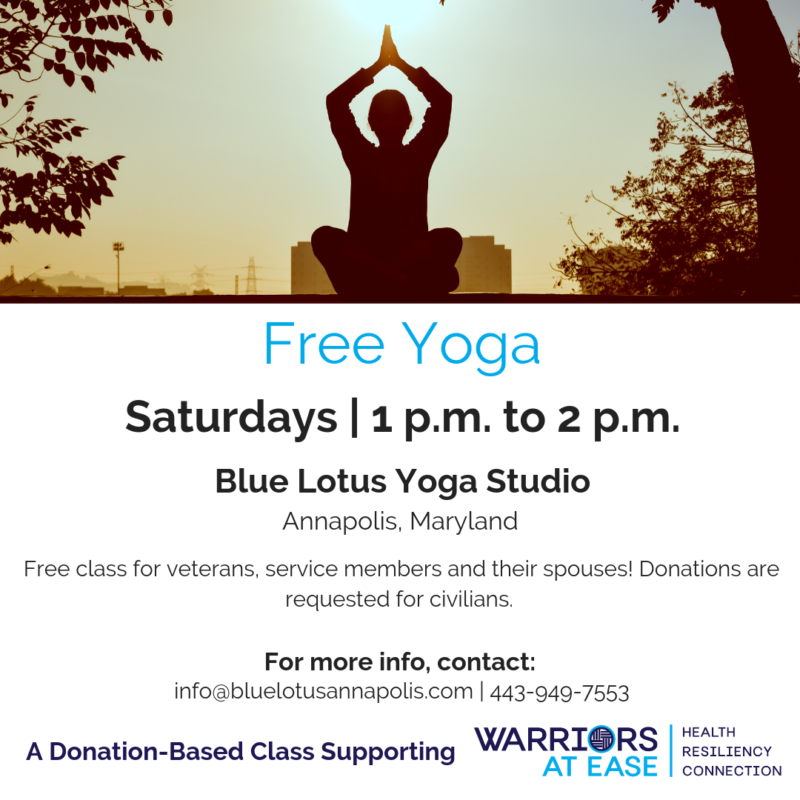 Join WAE teacher, Marcia, for a free yoga class for veterans, service members and their families and guests in Alexandria, VA! Join her on your mat at 6 p.m. at 5428 Eisenhower Ave, Alexandria, VA 22304 on Mondays. Join WAE teacher, Kat, for a free vinyasa flow yoga class for active duty members and veterans! Join her on your mat at 6:30 p.m. at The Om Center on Mondays. Join WAE teacher, Marcia, for a free yoga class open to all at Fort Belvoir, VA! Join her on your mat at 5:30 p.m. at the USO Warrior Center on Fort Belvoir on Tuesdays. Join WAE teacher, Sean, for a free, trauma-informed yoga class for veterans in Woodbury, Connecticut! Join him on your mat at 6:30 p.m. at the Woodbury Yoga Center on Tuesdays. Join The Space Ventura for a free Mindful Movement yoga class for veterans, service members and first responders! Donations are requested for civilians. Join us on your mat at 7:15 p.m. at The Space Ventura on Tuesdays. Join WAE affiliate studio, Life Moves Yoga, for a free yoga class for veterans, service members and their spouses in Killeen, TX! Hop on your mat at 6:30 p.m. at Life Moves Yoga on Wednesdays. Join WAE affiliate studio, Guiding Wellness Institute, for a Mindful Movement/Chair Yoga class that’s free for veterans and service members in Fayetteville, NC! Hop on your mat at 6:45 p.m. at Guiding Wellness Institute on Wednesdays. Join the folks at Blue Horizons Wellness, for a yoga and meditation class that’s free for veterans, service members, first responders and their families in Muskegon, MI! Class starts at 5:30 p.m. at Blue Horizons Wellness on Wednesdays. 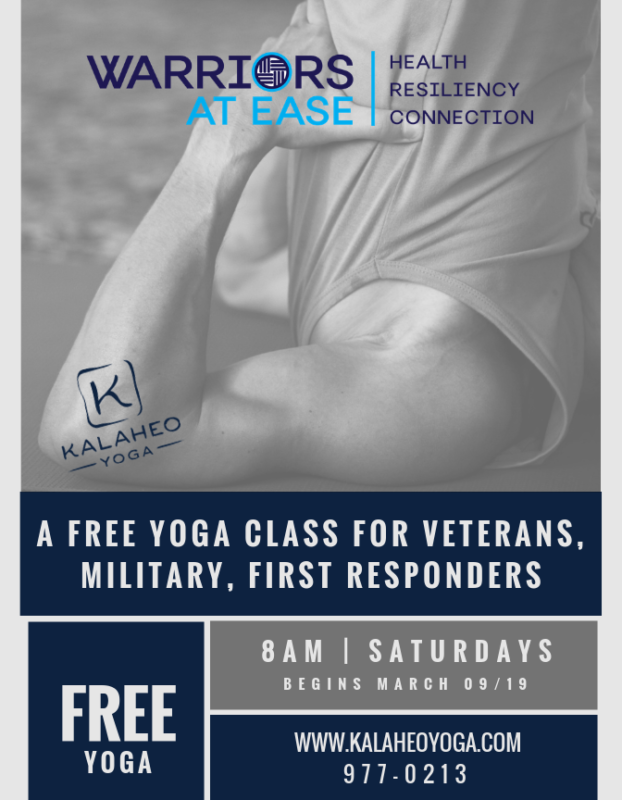 Join WAE affiliate studio, Bella Kai Yoga, for a yoga class that’s free for veterans, service members and their families in Kailua, HI! Class starts at 7 p.m. at Bella Kai Yoga on Wednesdays. For more information, contact: bellakaiyoga@gmail.com. Join WAE teacher, Aron, for a free yoga class for veterans, service members and their families and guests in Wilmington, NC! Join her on your mat at 6 p.m. at Legends Athletic Training on Thursdays. Join WAE affiliate studio, Guiding Wellness Institute, for an iRest Yoga Nidra class that’s free for veterans and service members in Fayetteville, NC! Hop on your mat at 7 p.m. at Guiding Wellness Institute on Thursdays. Join WAE faculty member, Annie Okerlin, for a free community adaptive yoga class for veterans on the second and fourth Thursdays of every month in Tampa, Florida! Hop on your mat at 10:45 a.m. at Bella Prana Yoga Studio on the second and fourth Thursdays of the month. Join WAE affiliate studio, Guiding Wellness Institute, for a therapeutic yoga class that’s free for veterans and service members in Fayetteville, NC! Hop on your mat at 9:15 a.m. at Guiding Wellness Institute on Fridays. Join WAE Certified Teacher, Janel, for a free, trauma-informed yoga class for veterans and service members followed up by an iRest practice! Hop on your mat at 1 p.m. at Fort Valor on Fridays. Join WAE teacher, Lisa, for a weekend yoga class that’s free for veterans, service members and first responders in Kauai, Hawaii! Hop on your mat at 8 a.m. at 4427 Papalina Road, Kalaheo, Kauai, Hawaii 96741 on Saturdays. Join WAE teacher, Melissa, for a weekend yoga class that’s free for veterans, service members and their families in Roxboro, North Carolina! Hop on your mat at 3 p.m. at American Legion Post 138 on Sundays. Join WAE faculty member, Annie Okerlin, for a community adaptive yoga class that’s free for veterans in Tampa, Florida! Hop on your mat at 12:30 p.m. at Bella Prana Yoga Studio on Sundays and stay afterwards for coffee and conversation.